Hello my faithful reader(s). I have been away for a while but do not despair: I am back and 2010 promises some really cool posts. Today’s post centers on extracting variable record types to a single flat file. This applies to data warehouse type files that have header, detail & trailer records somewhat similar to those I have seen for terradata and other warehouse applications. There will also be a future post in this blog that will describe how to load this data type into your warehouse along with some built in intelligence. 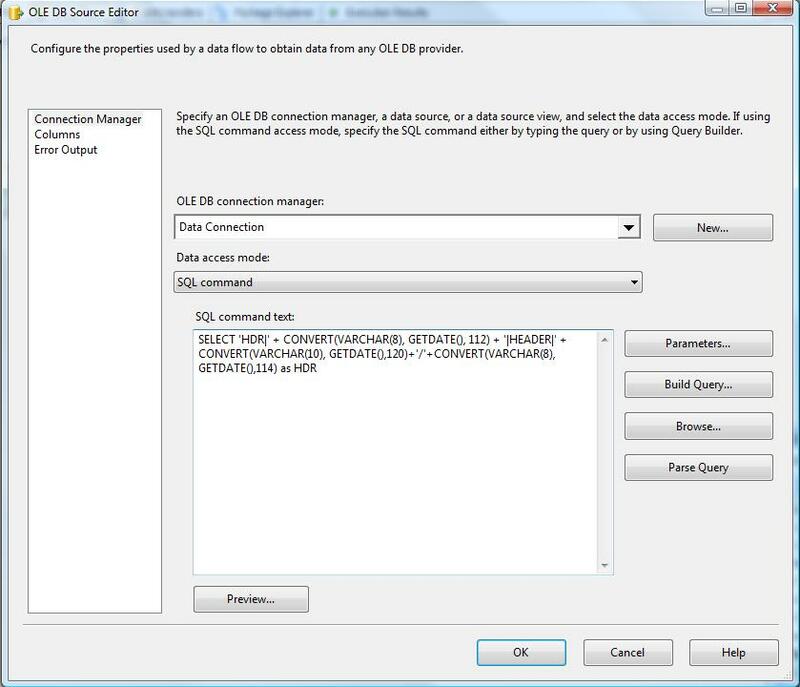 Verify that a single column is being displayed for that connection manager. Next, drag and drop a flat file connection into the dataflow and set it up as you would a normal flat file. NOTE: Make sure you check overwrite file in the Flat File Destination Editor. This will ensure that your file is fresh each time this job is executed. 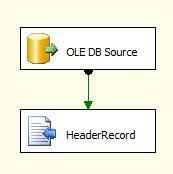 Now create a second data flow task and just as before create an OLE DB Source. 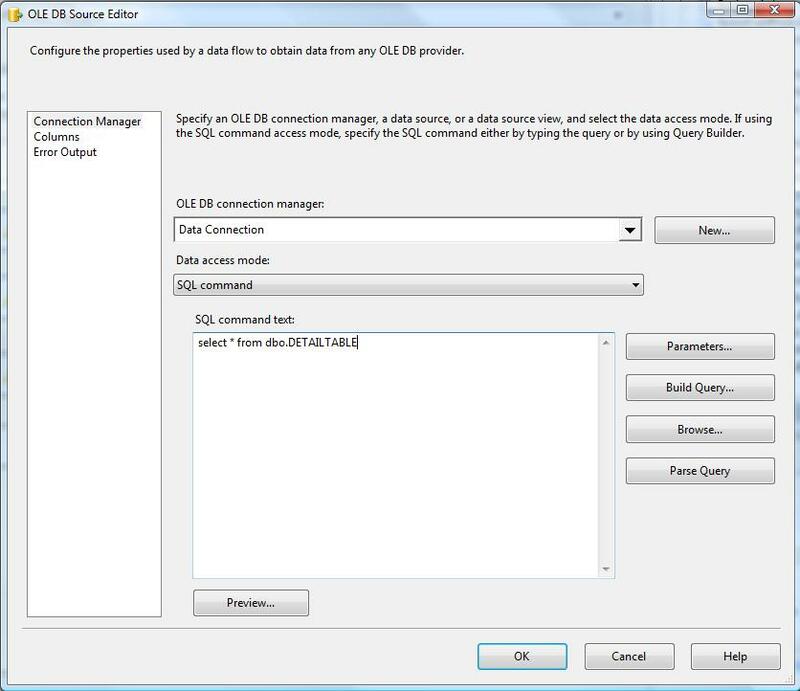 Choose your OLE DB Connection and choose SQL command as your data access mode. The SQL command here will merely extract all of the records out of a particular table. Once the extraction is complete, lets utilize the nifty RowCount transformation. Connect the OLE DB Source to a RowCount transformation. Before you set up your RowCount transformation, you will need to create a variable at the package level called Records (type Int32). When you set up your RowCount transformation, choose the newly created variable as your VariableName. Just as you did before, drag and drop a flat file connection into the dataflow and set it up as you would a normal flat file. 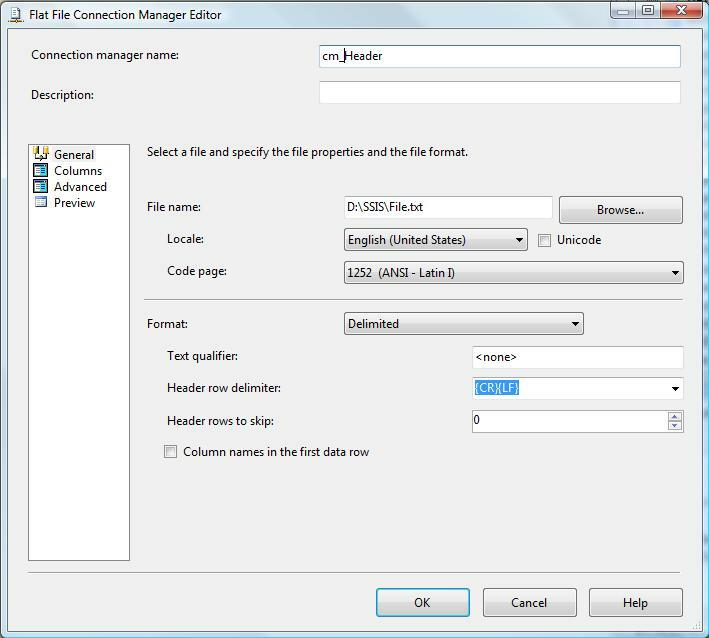 HOWEVER, make sure that the flat file is the exact same file that your header record is being extracted to. NOTE: This time. 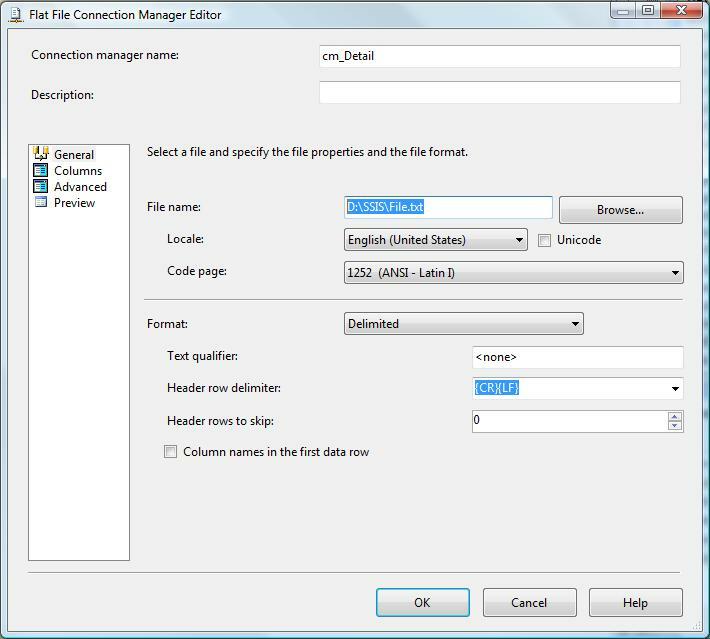 make sure you uncheck overwrite file in the Flat File Destination Editor. 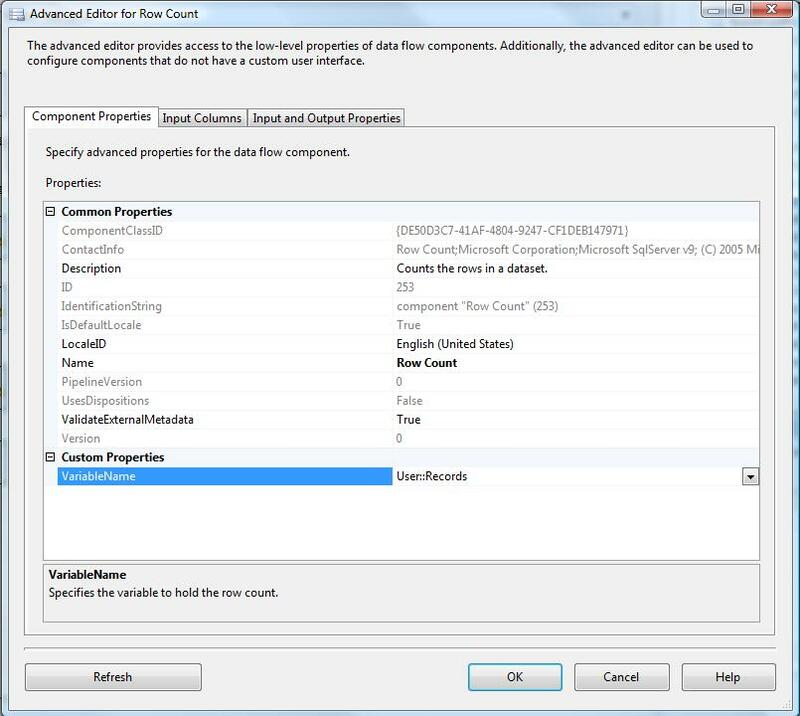 This will ensure that your detail records will append to your header record. 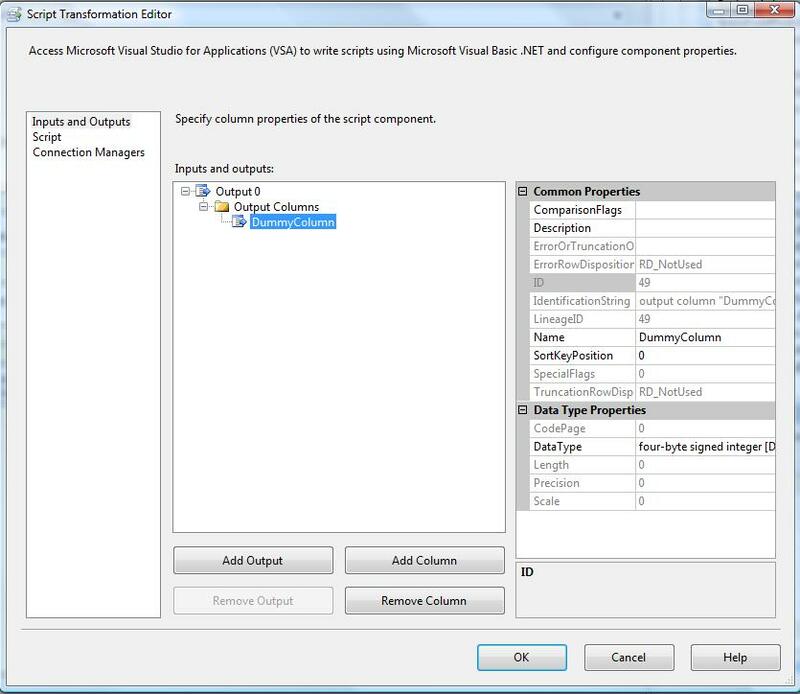 Lastly, create a third data flow task but this time choose a Script Component Data Flow Transformation type Source. 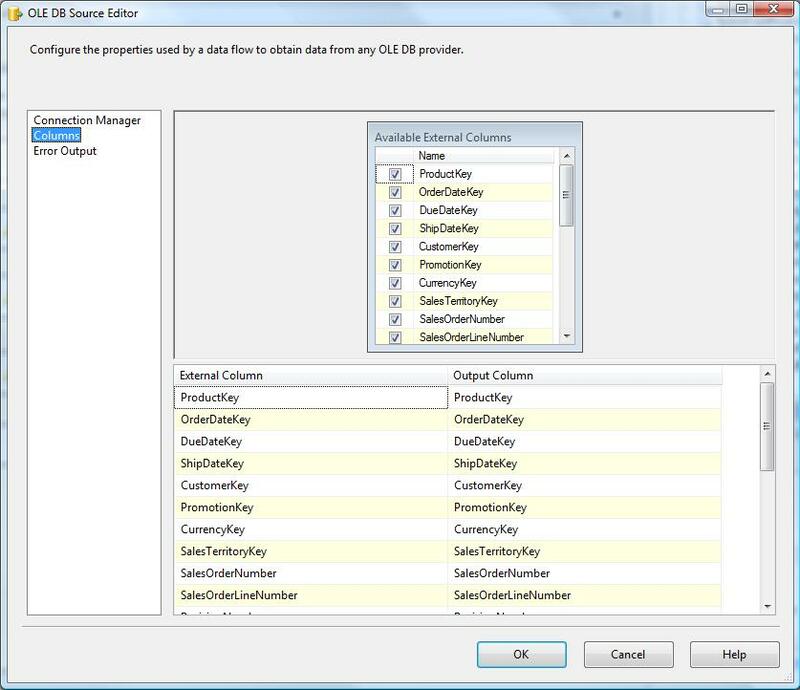 Setup your Script Component Output with a single column called DummyColumn. Copy and paste the below script into the script window. 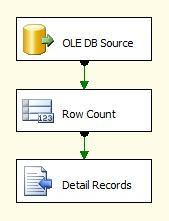 This essentially creates a dummy source so that we can now utilize our variable ‘Records’ in the data flow. 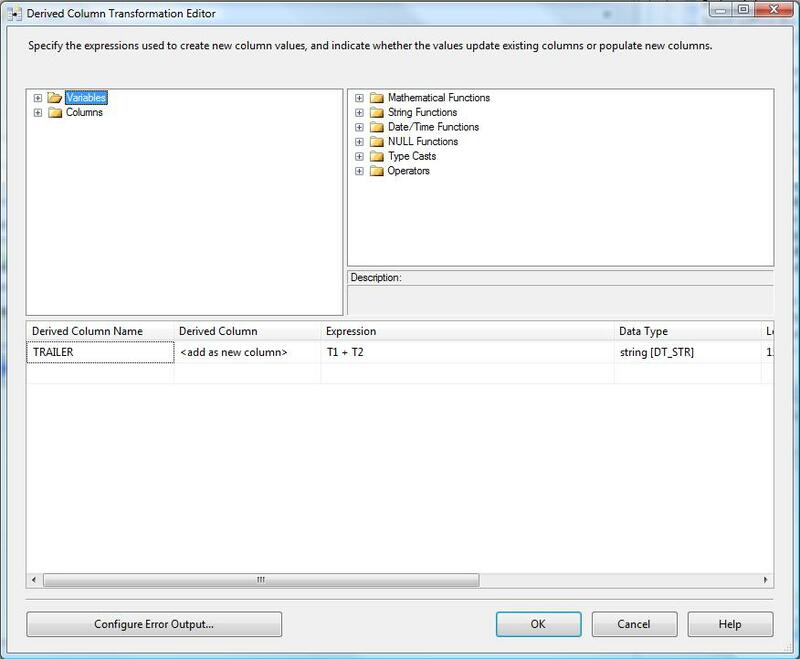 Once you have completed the script task, create a derived column transformation and create two new columns for that transformation: T1 & T2. 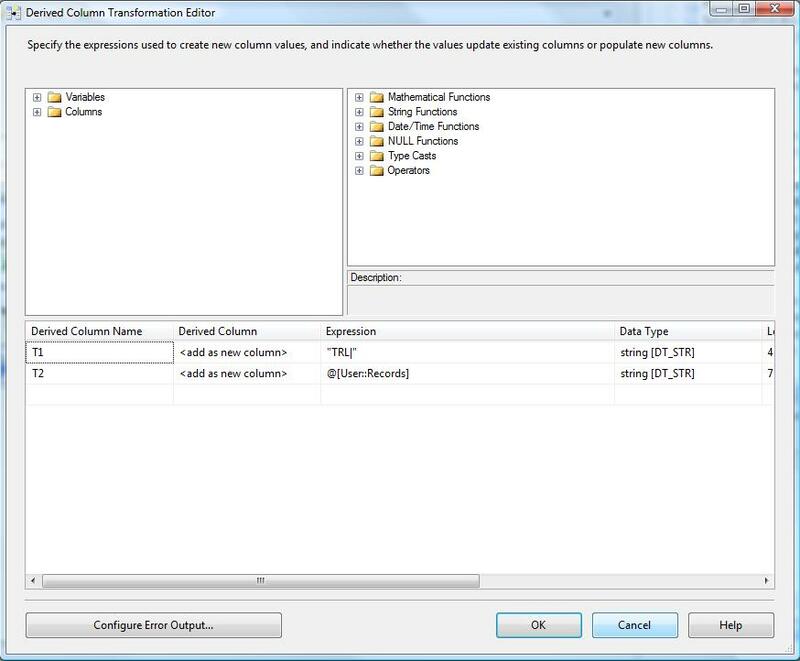 Just as you did before, create a second derived column transformation and create a single column for that transformation: TRAILER. Set the TRAILER expression equal to T1 + T2 which will concatenate “TRL|” and the number of detail records in your extraction similar to TRL|5. 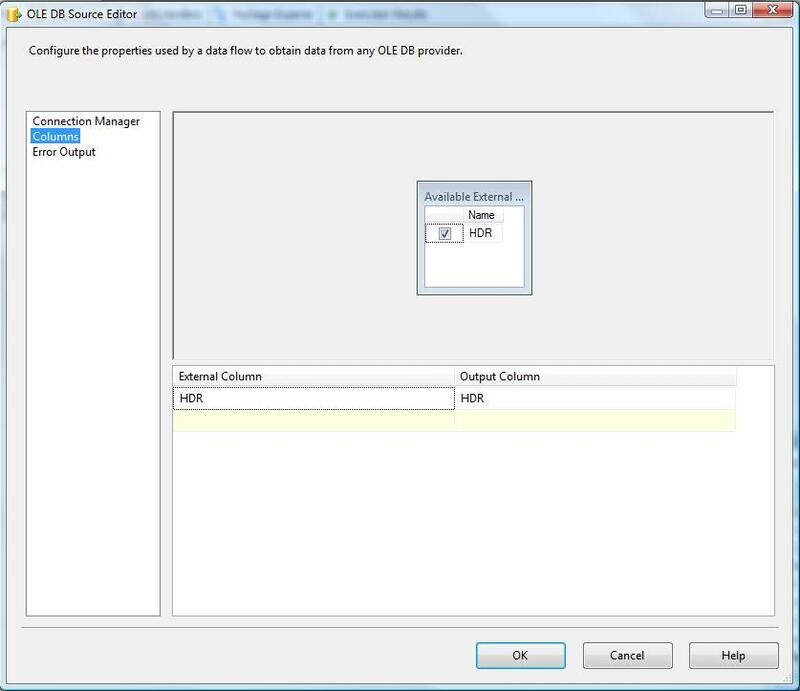 Drag and drop a flat file connection into the dataflow and set it up as you would a normal flat file. Again, make sure that the flat file is the exact same file that your header record is being extracted to. NOTE: Also, make sure you uncheck overwrite file in the Flat File Destination Editor. This will ensure that your trailer record will appends to the end of your file. Now your third data flow will look like this and you will have successfully extracted variable record types to a single file. 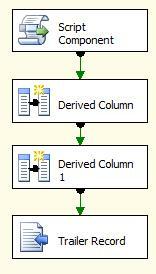 This entry was posted on January 22, 2010 at 10:01 pm and is filed under Data Analytics, Data Warehousing, SSIS, VB.NET. You can follow any responses to this entry through the RSS 2.0 feed. You can leave a response, or trackback from your own site.